Getting locked out of your home or vehicle is one of the most annoying conditions. In panic, most of us start using their own methods and make the situation even worse. Such unwanted actions can cost you hundreds of dollars. So, make sure instead of performing any unwanted action, it is good to stay calm and think for some effective ways to tackle the situation. It is advisable to contact a professional locksmith for effective and affordable solution. When people are locked out of the house, they generally kick the door. Kicking the door will do no good to you, rather it will make the condition worse in front of you. When you kick the door, you cause immense damage to it. You might have to repair or replace the complete door. In frustration, most of the people even break the doorknob and it leads to expensive repair. You would have to replace the knob which will cost you more. Never break the windows to enter your home as it may injure you and cost you hundreds of dollars. In case, you think that this is the best option, then you should be ready to get your window replaced. People often try DIY methods to get rid of the problem as soon as possible. It is advisable to never try such methods specially when you have no knowledge or skills. 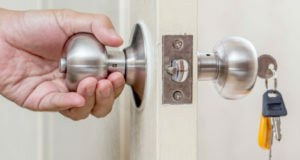 If you are locked out of your home or car, it is ideal to contact a professional locksmith as they have the tools to solve the issue effectively. If you don’t want yourself locked out again, make a call to our locksmiths at Calgary 24/7 Locksmith.